Size: 147mm x 105mm (A6): approx 5.7" x 4.1"
Shot placement for Elephant, buffalo, lion, leopard, crocodile , hippo, gemsbok (oryx), giraffe, kudu, impala, blesbok, sable, warthog, wildebeest, zebra and springbok. Additional Buffalo, Elephant and Lion pages. Size and weight of typical specimens. Rowland Ward and SCI No.1 ranked animals and their relevant measuring systems. 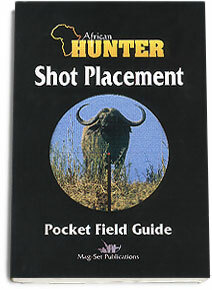 Additional placement and hunting tips for individual species. Blank note pages for personal observations. Condensed works on comparing and converting SCI and Rowland Ward systems of trophy measurement. Allow 8 to 10 weeks for shipment to arrive from Zimbabwe. If you suspect a shipping error, please contact us so we may correct the problem.